On November 16, Brian Carroll and Christiana Sasser ‘18, mechanical engineering, rose at 3:45 a.m. to drive to Lancaster, PA. After a briefing, they, a student from Millersville University, a pilot, and a technician took to the skies in a research airplane. Carroll, a student in the atmospheric physics Ph.D. program, had used detailed weather forecasting to meticulously plan the route to track a cold front passing through the area. Onboard instruments would collect data about how it affected the local air mass all along the way. The plane chased the cold front across Atlantic City, NJ and then out over the ocean. But weather can be fickle, even with the best-laid plans. “We never caught the cold front,” recalls Carroll. “We had to decide in the moment how we were going to salvage this and make it a decent research flight.” They did—the group instead focused their data collection on exploring differences in the planetary boundary layer (PBL) over water, the coastline, and farther inland. The PBL is the lowest layer of the atmosphere and can be anywhere from several hundred to 2,000 meters from Earth’s surface. UMBC atmospheric physics Ph.D. student Zhifeng Yang on the runway next to the aircraft he will fly in to collect meteorological data. 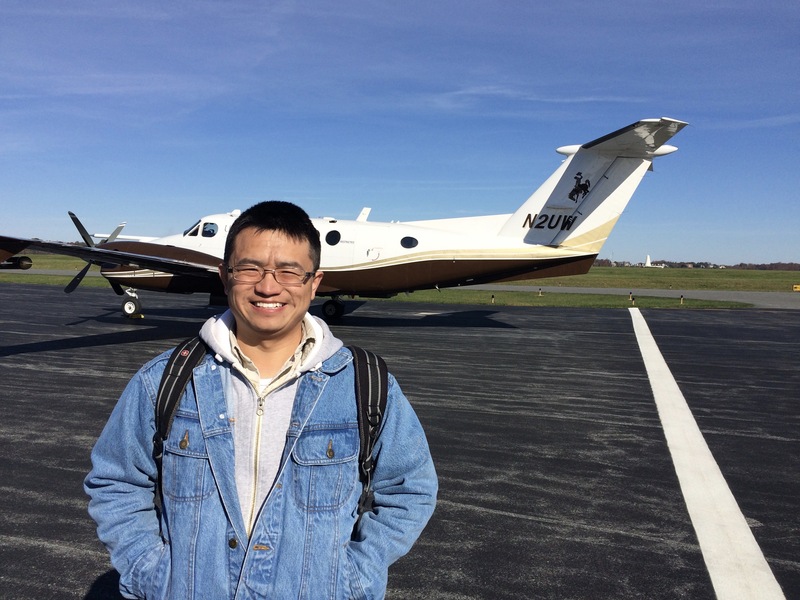 The third UMBC student participant, atmospheric physics graduate student Zhifeng Yang, participated in a second UMBC-led flight with Carroll on November 11. Belay Demoz, director of UMBC’s Joint Center for Earth Systems Technology and professor of physics, and Zhibo Zhang, associate professor of physics, supported the students. 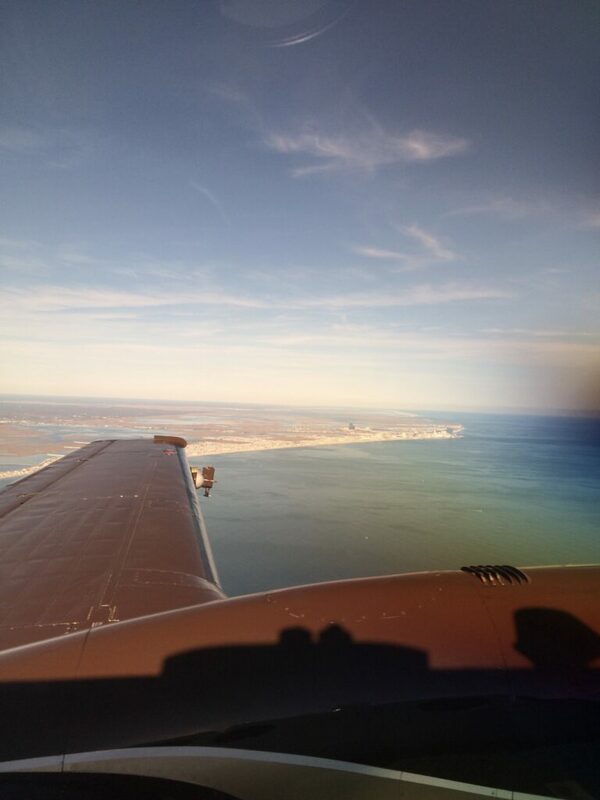 The view from the King Air aircraft during one of the two UMBC-led flights. In all, 175 students participated in the program, which was intended to serve as a springboard for students’ research projects while giving them hands-on experience with the instruments and process required for in-flight data collection. The resulting data cache was immense: Instruments on the aircraft measured a few dozen variables every second for 40 total flight hours, in addition to data collected by 50 weather balloons and two ground stations. The instruments included two Light Detection and Ranging (LiDAR) systems (one pointing skyward and one toward Earth), sensors to detect gases such as methane and carbon dioxide, and tools to measure temperature, humidity, wind speed, and more. Demoz, who encouraged his students to get involved with the project, would like to see a similar flight series happen in the future, closer to UMBC. “He’s always pushing students to get as much professional experience as they can,” says Carroll. 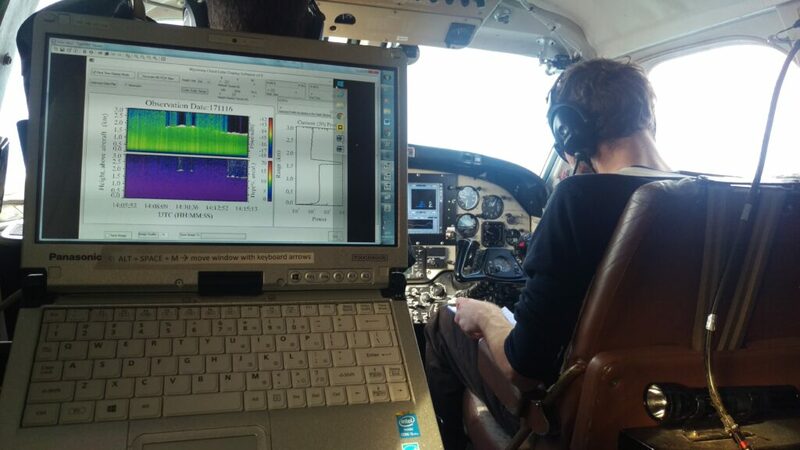 Atmospheric physics Ph.D. student Brian Carroll and a visualization of data instruments on the plane collected. Carroll will use a similar type of aircraft to collect data for his doctoral research, “so knowing their capabilities and how to deal with them is definitely going to be valuable,” he says. Yang’s research seeks to improve weather forecasting models, so “we need observational data to evaluate the model, so we can adjust it to get better simulation results,” he says. Banner image: The King Air aircraft, ready to fly. Photos by Zhifeng Yang.